Our Scene: The Play takes place in the half-virtual reality of : the newborn French Law 1rst March 2012 « sur l’exploitation des oeuvres indisponibles du XXème siècle » concerning, thus, the right that the French institutions allowed themselves to take over (without our consent) any book published between 1rst of January 1901 and 31rst december 2000. The Stage: the French National Library, hosting the webpage of this project. And the Actors: THEM (the people who said with a cold-bloodedtranquillity wonderful to behold that « their project will spare them the need to review the publication contracts one by one » (no comment), And US = the writers (written texts, fiction or essays, whatever), but also translators, illustrators, photographers and all possible kind of visual artists taking part in a book. Addressing this last point (Visual arts) : the reason is, obviously that ReLIRE takes each book « as a whole », in a bundle, with all its pieces and parts. Including, thus, the cover art, the translations, and so on. They probably intend, (in a way well-matched to the taste for easy-lazy work betrayed by their aforementioned statement "about the tiresomeness of checking the contracts and find the Right-holders"), to issue the digital editions in fac simile, with a minimum of work required from them, and a maximum result of looting of all the elements in the book, including Text/illustration/and book design. Nota bene: For a maximum clarity in my explanations, I will have to talk to YOU in a « ReLIRE for dummies kind of way ». No offense meant, I swear, but, like many administration-related junk, this whole process is arid, mathematical, and sometimes very confusing. AND we are warned: any missing info or piece will lead to the rejection of our opt-out. And you begin to type author’s names, titles, ISBN or keywords (words from the title or subtitle) in the search engine. NB: Keep it simple : type just the title OR a name OR a publisher. Too much information will return no result. Do not try to type a short story’s title : they are not “indexed”. You wonder again: Will I have to brainstorm, then, and list all my past publications in France prior to year 2001? and then track them through this antique engine? The answer is yes… with a reserve : you should also test the books published after the official deadline stated by the Law. Because numerous books that shouldn’t be there (published well after year 2000) were spotted on the List. And though the mistake is theirs, they think that our responsibility is to “over check” by ourselves and correct them, if they are wrong. Following this frame of mind, if they listed one of your Works by mistake, and publish it, it’s partly your fault, so I don’t think that they will make the cancel procedures easier after the “six months deadline” for books falling within this category. Maybe you do not wonder (but you should): Can I trust the programmers? Did they spell our surnames correctly? – The answer is : no, you can’t. Accordingly to the first “crash-tests” by fellow-artists, a lot of misspellings found their way into the List. You should check by “titles”, too. And now you might logically ask: Well, according to what you said about their possible plan to print facsimiles of the books… if the editor/director of a collective work, (let’s say a collection of short stories, or a collection of essays), opt-out successfully… doesn’t it cancel the digital re-issuing of the whole book? It certainly should, according to our previous set of Laws. For the editor/director is holder of the copyright over the choices he/she made, the idea (except if the collection was an “order”), and the whole ‘architecture’ of the book. The question was asked to THEM but has received no answer yet. So the realistic answer, for now, is : we don’t know. ReLIRE wants money, and doesn’t intent to be stopped. They could decide that a little work of of cutting and sewing, excluding the opted-out texts while keeping the others is worth the effort. One should never bet too lightly on the laziness of the adversary, when money is at stake. For the novels, the task is quite ‘simple’ : search your name, and the French title of the work. It is possible to search by Publishers, too. WARNING : For the texts (fictions or essays) included in collections (collective works) : you might wonder: Are all the included Writer’s names listed, and can I spot mine through the search engine? The answer is: no. You will have to rely on your knowledge of your own body of work, and search by book title. About this: you might wonder too: Are you sure that any writer appearing in a collective book is allowed to opt out? Yes I am. For the BnF answered this question on Apr. 11th. They replied to a writer asking about that: “Dans la mesure où il s’agit d’une oeuvre de collaboration dans laquelle la contribution de chaque auteur est clairement identifiable, chaque auteur peut s’opposer à sa gestion collective”. Meaning that in Works where the individual contribution of each author is clearly identified (say: the authors of each of the short stories in an anthology), each one of the authors is allowed to opt out for is own texts. In the case of collective works where the authors are not so clearly mentioned (Encyclopaedias, for example) the deed will be more complex. We keep this listing up to date on a regular basis, to reflect the evolution of the public echoes. Keep steadfast, for you only have 6 months to opt-out. And the BnF will take some 3-4 months to review your opt-out and give its verdict. You see what I mean? Don’t delay too much! 1/ - Signaler la disponibilité commerciale de cette oeuvre = is the way to tell them that they've made a mistake, and that this book is still in print, and available to the public. And thus not subject to the ReLIRE Law. 2/ - Demande d’opposition à l’entrée en gestion collective d'une œuvre. 3/ Signaler une erreur dans une notice = You’ve just spotted a mistake in an entry: misspelling, wrong ISBN, and so on, and want to tell the staff. I didn’t had the dubious ‘chance’, yet, to test the options 1or 3 (and thus can’t tell what the differences are between these ones and option 2. NB: I didn’t have the opportunity, neither, to test the options 2 and 3, so I won’t talk about it for now. SCENE 3/ do not forget the Lyrics! You select the good answer (you know who you are, don’t you ?) and go on. Let’s be… « graphic », here, to simplify the maneuver. 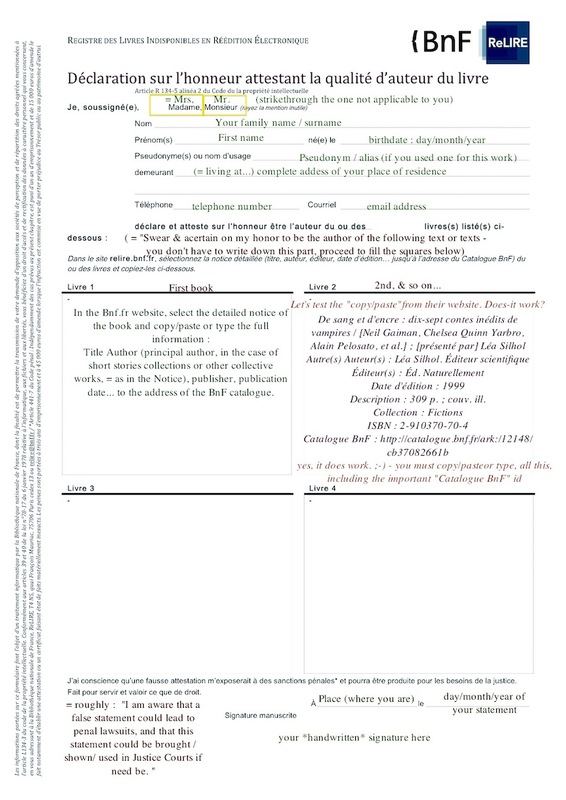 You will find (below) the annotated / translated version of the « real form that you will have to fill in ». PLEASE NOTE: that any missing info or mistake could (and shall, most certainly), lead to a rejection of your opt-out. They insist on this point, and as they do not want you to escape their plan, they will not be kind on your mistakes. Nota Bene: In the case of short stories you really should specify that you opt-out for your short story, Informations complémentaires into the "Informations complémentaires" box, in order to avoid possible confusions. You can say-it-in-French like that: " Opposition pour ma nouvelle "TITLE", traduite de l'Anglais et incluse dans ce volume. Votre action n'est pas conforme aux termes de cession limitée inscrits au contrat"
« suite » is the validation/ ‘check out’ button for this whole process. If you forgot something, the page will ask you to correct the data provided but, thanks G___, the info that you previously typed will stay on, so you won’t have to type everything again! When you’ve completed the task, to the full satisfaction of the Machine, you are nearly done with this online process. As the Machine won’t send you a copy of your own declaration, and as the obvious lack of helpful dispositions and fair-play may legitimately spark your paranoid side, you should print or capture the page before you press the « suite » button. In order to keep proof of « what you said » to the Machine. The Machine says: Votre demande d’opposition a bien été pré-enregistrée. The best to do is to print or capture, the whole page! It’s an evidence of the fact that you did opt-out and at which date – If something goes wrong later, it can be useful in Court. Good-to-know: « cerfa » is the label/tag of all the French official paperworks. When you see this label on some fill-it-yourself paper, it’s always an official / legal / Government approved form. THE FIRST ACT IS COMPLETE, Aka: The online process is done. The same page instructs you about what you’ll have to do next. Take courage and go on. You’ll have, now, to prove your claim. 2. Une déclaration sur l'honneur attestant de votre qualité d’auteur (modèle de déclaration sur l'honneur à télécharger). 2 - A statement in which you’ll certify that you’re the Rights holder. A “declaration on Honor”, here, is an oath, similar to the ones some foreign courts of justice would ask you to swear on a Bible. False declarations can lead you to serious penal lawsuits. - (modèle de déclaration sur l'honneur à télécharger), says the same line: you may download here a template for this statement. We will have a look at this paperwork (below). Back to our “visual mode”! = These papers, along with the ID number of your case, must be sent to the BnF. 1/ - You can attach them to an e-mail, “with a Return receipt”. Well… their sentence is not perfectly clear, here. Do they mean that you must ask for a receipt in the text (body) of the message you’ll send to them OR that you should program the function imbedded in many email softwares? In any case… this option is the less “secure” of the 3 options proposed to you. 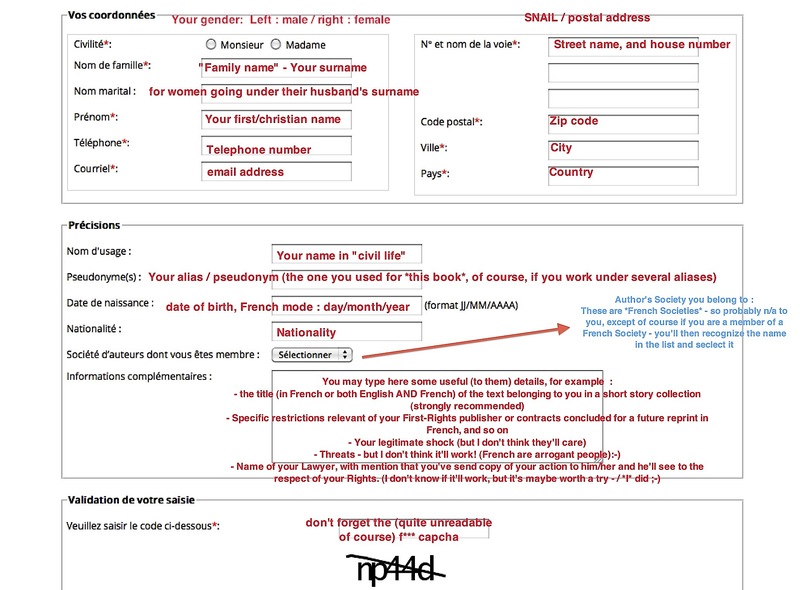 2/ - "Soit par courrier recommandé avec demande d’avis de réception, à l'une des 2 adresses suivantes: Par courriel, à relire@bnf.fr, en indiquant la référence de votre dossier dans l’objet de votre message (exemple: « ReLIRE: demande d’opposition n°00000 »)." By regular & classical (paper!) postal letter, with Acknowledgement of receipt. You must, here again, inscribe very clearly the opt-out file number they provided in the final stage of the online process. Onto the envelope, and, for maximum security, on the papers inside. I suppose that to join a printed copy of the online receipt page could be a good idea, and simplify the process by skipping the annoying letter to join (in French) to the batch ! Please find enclosed the papers you required in order to complete my opt-out request (NUMBER) for the text / or book (depending on your situation) (TITLE) which I authored. Looking forward to hear from you ASAP. … And you send the « thing » by the mean you selected among the 3 that they propose.. I recommend the most secure possible way, for the whole system smells so much of a voluntary design to make things heavy, annoying, complicated, that I really don’t trust the fair-play of the game. This whole interface is so « vintage » that it could be comical, coming from people ambitioning to become « Kings of Digital-World ». They are, maybe, just as dumb as they appear through this antique platform. Or it could be a deliberate design to make the writers quit, and give up fighting, when they find themselves in front of this Sisyphus’ torture. Better to be (over)prudent than sorry, in my humble opinion. When your file is sent, your work is done. Hopefully once and for all. ACT III / The ball is in their camp – What to expect? La BnF, à réception de la demande, s’assurera qu’elle est complète. At this stage, a new mention will appear on the register online, signaling that an opt-out request was issued, and is examined. The Society will examine your claim and decide if you have the right to opt-out, and let you know, along the BnF, of their verdict. ... si l’opposition est validée, les informations relatives aux titres sur lesquels porte l’opposition ne seront plus accessibles au public dans ReLIRE ; si l’opposition est rejetée, la mention sera supprimée de ReLIRE. Le délai maximum de réponse à la demande par la société de gestion collective est de 3 mois suivant la communication des pièces par la BnF. If (I like that « if » ! don’t you ?) your opt-out request is accepted, they will amend the list in their ReLIRE online base. The infos about the book will be unavailable to the public via the Search Engine. If they reject your opt-out request, the « processing opt-out » on the Book Notice in the Register will… be deleted. They give no details about the way how, in either case, the Rights Holder(s) will receive their answer, and if they intent to provide any explanation if they reject your claim. They don’t make mention of our means to oppose their verdict if this verdict is unjustified. Yes, I know, all this stuff seems incredible, and so kafkaian that it’s very difficult for any human being graced with a sound mind and good manners to embrace the reality of the concept. But, alas, though it tastes like a Sci-fi joke, it’s nothing of the kind. It’s very real. And it’s only a beginning. Year after year, new lists will appear, and more & more of our Works will be targeted by this Monster. The process is awfully tiresome. Not without a cause, or goal. The importance to answer to it in a steady and courageous way is moreover vital for the future of the « French Market ». - You can also follow the stream on Twitter under #ReLire, and on the twitter account @Recaler_ReLIRE. The stream is mostly in French, alas, but the Foreign blogs or Press cuts are very often RT there. - We are working on a FAQ (online), to address the basics of the ReLIRE system. - We are considering launching a forum dedicated to helping the Foreign Artists to swim though this mesh, if need be. This « Manual » was put together as-fast-as-possible by Lea Silhol Writer, ex senior-editor, publisher, and author’s-rights & contract manager in a defunct French publishing house. Current CEO of Nitchevo Factory. © Léa Silhol 4 Nitchevo Factory under Creative Commons Licence. You are allowed to share this document ‘per se’/’as-it-is’ on a private level. Do not upload in public/internet spaces without the consent of the Right-Holders. Neither changes nor alterations permitted without the written consent of the Right-Holders. This document can’t be sold in any way, or printed in order to be sold.